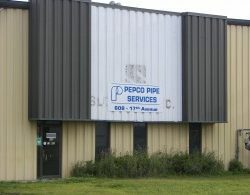 Pepco Building is a single-storey industrial development constructed in 1977. The property is located in the Nisku Business Park, which was established in 1973 to serve the province’s oil and gas industry and is located next to Highway 2, a major artery serving the province of Alberta. Pepco Building consists mainly of industrial shop space, with a small office and a sandblasting shop. The property comprises 22,659 square feet of leasable area.